Kiribati (pronounced "keer-ah-bhass") consists of 32 low-lying atolls and one raised island scattered over an expanse of ocean equivalent in size to the continental United States. Britain offered Kiribati an army; founding President Iremia Tabai said no thanks. Kiribati, geographically huge but dramatically under-resourced, straddling the equator for 3000 miles with a total population of 100,000, cannot sustain itself. By 2008 President Tong was already talking with New Zealand about finding a new homeland for his people when atolls become inundated. Kiribati was the scene of a strange power struggle between China and Taiwan. The islands, with a population (2011 est.) of 102,697, straddle the Equator and lie roughly halfway between Hawaii and Australia. The three main groupings are the Gilbert Islands, Phoenix Islands, and Line Islands. In 1995 Kiribati unilaterally moved its date line to include its easternmost islands, putting the country in the same date and time zone. This republic may rightfully be called "the most oceanic state" in Oceania — one of the largest collection of islands in the world, scattered over the huge expance of the planet's largest ocean. The 33 atolls which comprise Kiribati extend from west to east for almost 4,000 kilometers, and from north to south — for over 2,000. Yet their total area comprises only 823 square kilometers. As most of the other countries in the South Pacific region, Kiribati is among the smallest states in the world. The Republic of Kiribati is located on an archipelago formed by three groups of coral islands: Gilbert, Line and Phoenix. Its name comes from the toponym adopted for the most populated group of islands by the Russian scientist and traveller, the honored academician I. F. Kruzenshtern in the 20's of the last century. Kiribati is the closest variant of the word "Gilbert" in the pronunciation of the local micronesian dialect. (T. Gilbert was one of the English researchers studying the archipelago). The largest in population is Tarawa atoll (18,000 residents). The capital, Bairiki, is located here. The largest in size is Kiritimati atoll (364 square kilometers. Its former name was Christmas Island (Kirimati — the Micronesian variant of pronunciation for the English word "Christmas"). The state is still very young. Its independence was declared on 12 July 1979. Prior to 1975 it had been the British colony of Gilbert and Ellis Islands, and from 1975 through 1979, after the residents of the Ellis Islands — Polynesians - expressed the desire to create their own political formation (the state of Tuvalu), it was called Gilbert Island. The area of the populated islands is 719 square kilometers. 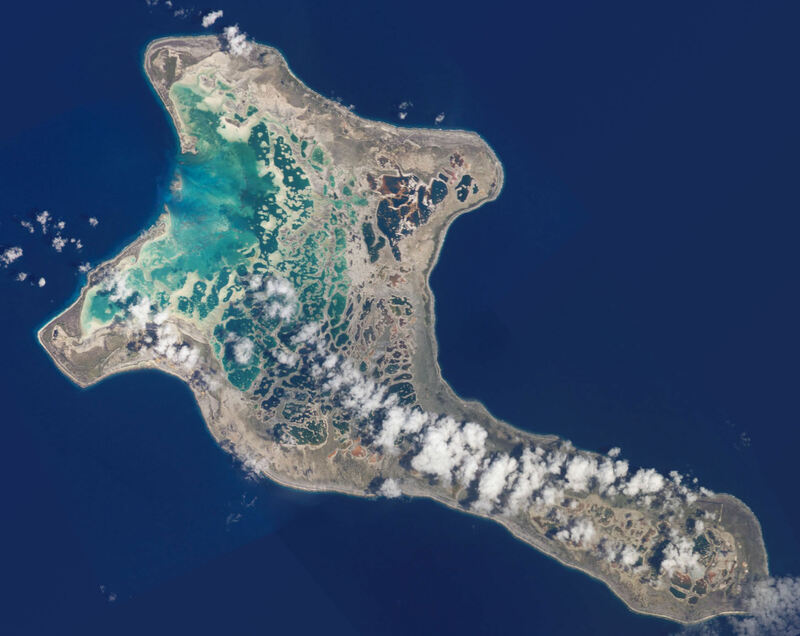 Pronounced “Ki-ris-mas,” Kiritimati Island has a large infilled lagoon that gives it the largest land area (125 square miles, 321 square km) of any atoll in the world. Captain Cook named the atoll Christmas Island when he arrived on Christmas Eve in 1777. Used for nuclear testing in the 1950s and 1960s, the island is now valued for its marine and wildlife resources. It is particularly important as a seabird nesting site—with an estimated 6 million birds using or breeding on the island, including several million Sooty Terns. Rainfall on Kiritimati is linked to El Niño patterns, with long droughts experienced between the wetter El Niño years.